We’d love your help. Let us know what’s wrong with this preview of Nita's First Signs by Kathy MacMillan. 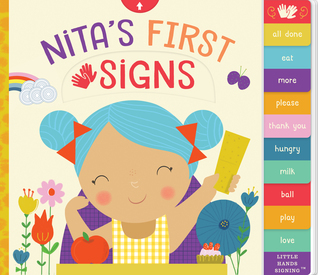 To ask other readers questions about Nita's First Signs, please sign up. I wish my little girl was younger so I could really use this book on her, because it is fantastic!!!! 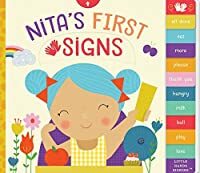 It is called Nita's First Signs and is by Kathy MacMillan, with illustrations by Sara Brezzi. My husband and I read the book together, trying the signs. It was fun. We practiced on each other too. The book is very bright and user-friendly. Each page has simple situations that occur between the baby, Nita, and her parents. The book has flaps that slide out of the thick, high-quality board pages, that show you how to do the signs for a certain word or phrase. Sometimes in a page, you have to remember a sign you have already learned in a previous page, to sign the phrases completely and correctly. It was a fun challenge to try to remember. This book is absolutely perfect to teach yourself and your baby how to sign common words, phrases, and manners, so that your baby can communicate with you even before she can talk. Thick cardboard pages, sturdy construction for moveable parts, simple signs, warm family interactions. This would make a good read-aloud or 1X1 sharing. Excellent book. OK, so I'm a little biased since I wrote this book. But the thing with picture books is that the author only does so much - and I am just as delighted as readers are by the beautiful illustrations and quality design that brought this book to life. I couldn't be prouder of the final product and I hope readers will feel the same way! First sentence: Nita is in her high chair eating crackers. Nita likes crackers. All done? Daddy signs. Eat more, signs Nita. Premise/plot: This board book is designed to teach caregivers and their little ones ten signs that they can use to communicate with one another. The ten signs included are: all done, eat, more, please, thank you, hungry, milk, ball, play, and love. The board book has sliding pages which reveal the signs and give a description. My thoughts: I enjoyed this one. I did. I'm not First sentence: Nita is in her high chair eating crackers. Nita likes crackers. All done? Daddy signs. Eat more, signs Nita. My thoughts: I enjoyed this one. I did. I'm not sure why Nita has blue hair--but other than that I liked it just fine! Parents can learn more about American Sign Language by visiting the author's website. There is a YouTube video of the author teaching these ten signs. I don't often give five stars, but this heart-warming little board book deserves it. Communication is never easy, but this may help. Beautifully illustrated to assist the pre-reader, the signs are clear and could spur both parents and children to learn more. Liked the illustrations; wasn't sure if I liked the flaps at first. Great board book that teaches kids and adults basic signs through a story. The format of this book is great to enable the reader to learn the signs being introduced. Attractive board book with tabs and gliding/sliding openings for explicit signs. This book is the greatest! I love the pull-tab pages, it feels very sturdy. What a great find!